When the summer heat strikes, few things taste as good as a cool bowl of ice cream. 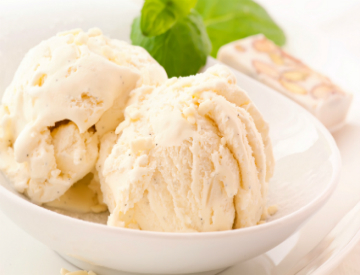 This summer, serve up bowls of this delicious Salty Honey Ice Cream. The recipe is simple to follow and results in a treat that will have everyone asking for seconds. You’ll love how the saltiness balances out the sweetness of the honey. Prepare an ice bath by combining a handful of ice cubes and a little water in a large metal bowl. Set a second smaller bowl inside the ice, and set up a strainer leading into the smaller bowl. Pour the honey into a small saucepan, and warm it over low heat until it is quite runny. Stir in the salt, and remove the pan from the heat. In a second saucepan, combine the milk and sugar. Simmer until the sugar fully dissolves. In a mixing bowl, whisk the egg yolks until smooth. Then, add about 1/4 cup of the warm milk to the eggs, whisking constantly to avoid cooking the eggs. Continue whisking, and slowly add the remaining milk to the eggs. Pour the egg mixture back into a saucepan, and cook until it reaches 170 degrees F. Then, pour the mixture through the sieve into the ice bath. Stir in the honey, followed by the heavy cream. Whisk until the mixture reaches room temperature, then refrigerate it. Churn the ice cream in your ice cream maker, according to the manufacturer’s instructions. Enjoy! Visit Hawaii’s Local Buzz to learn more about our raw honey from Hawaii, which is great for this summer recipe.